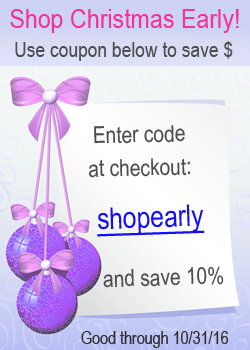 If you're looking for a gorgeous gift for mom -- we have it! Forever Loved is a beautiful mother's necklace made with quality craftsmanship. 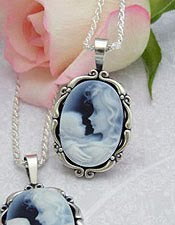 The genuine stone carved cameo is done with two-layered agate; the bottom layer is black and the top layer is white. The depiction of the mother and baby is absolutely stunning in the fine details. The scene clearly shows a mother's love for her child. 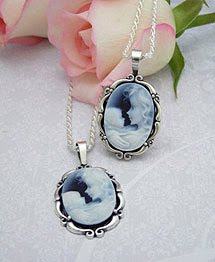 We have set the cameo in a graceful sterling silver pendant frame and included a rope chain. The chain is available in two different lengths. 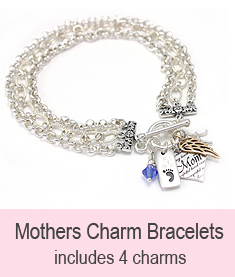 This makes a great gift for any mother, but especially a new mother. 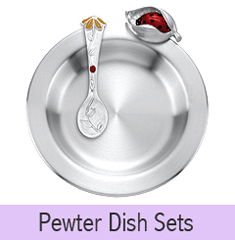 Limited quantities are available - if you'd like this for a Valentine gift, order early!